Country Living at it's finest...Look at all the pluses on well maintained 5 Acre Ranchette w/room for your toys & livestock. 3 bed/2 bath, light & airy single level home has vaulted wood ceilings & indirect lighting in great room. Warm up w/Pellet Stove on those chilly nights. Move in ready w/recently painted pleasant custom colors. Double closets in Master Bedroom. Attached 2 car garage off laundry-mud room. Covered front patio to take in the peace, quiet & views or back patio for BBQ's & entertaining before enjoying your fire pit. Fenced & Cross Fenced - room for round pen. HUGE plus is JVID Water for irrigation & possible JVID Domestic water on it's way. 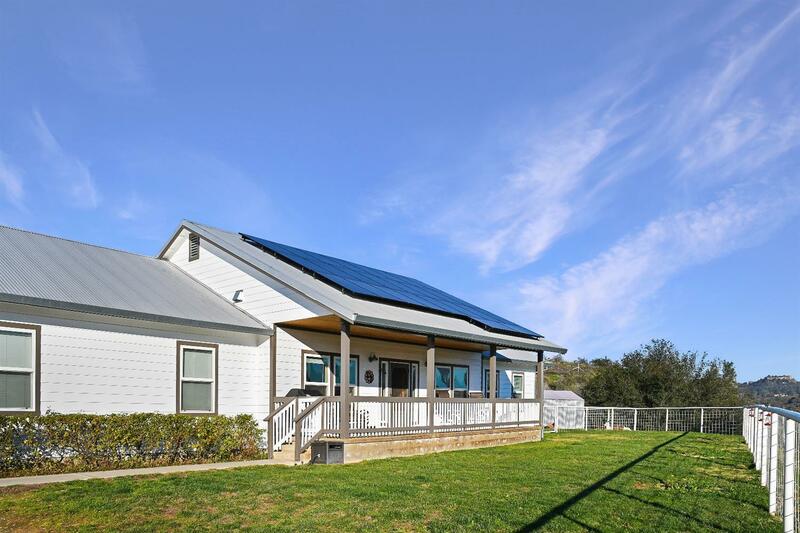 Solar installed makes for extremely low PG&E bills. 24X36 SQ FT Detached Shop. Two 220 Amp Services. RV, ETC parking in two huge carports 22X50 & 20X30. Cement Siding & Metal roofs on home and shop for fire safety. Kenetico water system. Volcano Telephone in process of installing New upgraded Fiber Optic High Speed internet in area.